This fall, pink frosted donuts, wrist bands, caps, tension footballs, and bandanas were sold to raise funds to support cancer research and to celebrate "the cure." All of the items were carefully chosen by the dedicated members of the Chesed Committee. Challot, baked by our students with an added sugar crumb topping and tied with pink bows, were a hit. The ultimate caveat was that boys did not have to wear ties or collared shirts if they wore pink shirts, a win-win. The funds raised were sent to Sharsheret and to the American Cancer Society. The essence of the pink themed day was expertly presented by Dr. Nicole Schreiber-Agus. 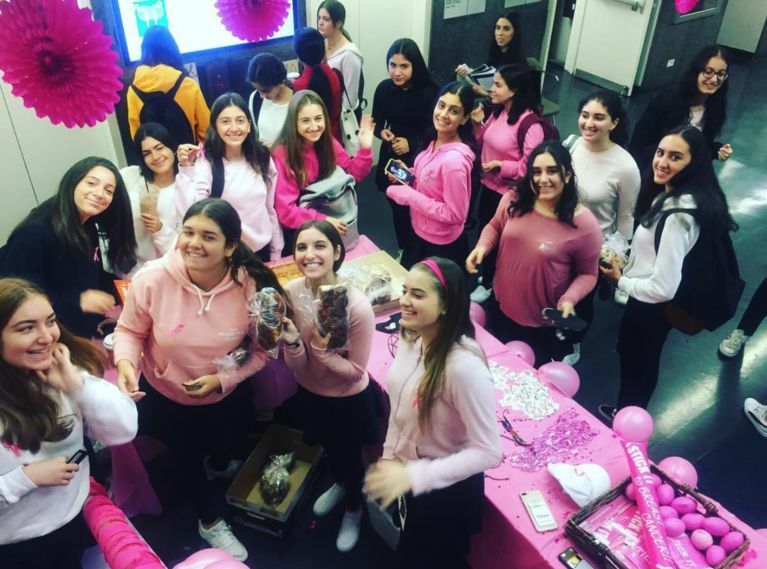 Dr. Schreiber-Agus spoke to the senior grade - and the title of her outstanding talk best captured the meaning of the color - "Taking Home a Message or Two from PINK DAY at Ramaz." Dr. Schreiber-Agus, Ph.D., is the co-founder and former director of the Program for Jewish Genetic Health at Einstein, where she also co-led the BRCA community testing initiative. She also founded MyJewishGeneticHealth.com, an online education series, and she currently focuses on scientific writing and on community education about genetics-related topics. Dr. and Mr. Agus are the proud parents of Gabrielle '13, Alex '15 and Elan '21. Dr. Schreiber-Agus' renowned scientific successes were complemented by her warm and unassuming manner and the seniors responded to her welcoming style and expertise. Dr. Schreiber-Agus was comfortable in saying what has to be said, and did so with ease, even when addressing the taboos. Most important, she challenged students to recognize that research is ultimately the key to the cure, and the significant role they have in supporting these scientific endeavors.